1) What makes Blue Phoenix Financials unique from other financial websites? Blue Phoenix Financials is perhaps the only online financial website that provides in-depth News, Analysis, Strategies, Videos and Market Tips on ALL major global asset classes including ETFS, Bonds & Options. 2) How Accurate Are Blue Phoenix Financials’ Market Tips? Blue Phoenix Financials boasts an accuracy ratio of 80% using a proprietary system that combines technical indicators with a philosophy of risk/reward ratio analysis. 3) What is the philosophy of Blue Phoenix Financials? Blue Phoenix Financials aims to be a game changer in the Investment industry through Accuracy, Neutrality & Transparency focusing on results that purely benefit it’s subscribers. 4) How Updated Is the Information on Blue Phoenix Financials’ Website? The information on Blue Phoenix Financials’ website is updated constantly, on a real-time basis, with trade alerts, breaking-news and special report trading strategies covering global asset classes: ETFS, Equities, Bonds, Futures, Options & Foreign Exchange. 5) How Do I Gain Access To Blue Phoenix Financials’ Market Tips & Trading Strategies? 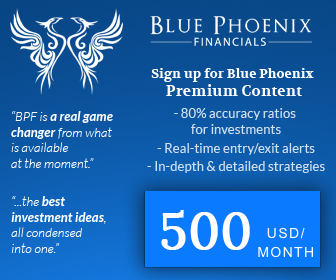 To gain access to Blue Phoenix Financials’ Market Tips & Trading Strategies, you have to first sign up for Blue Phoenix Financials Premium Content. 6) Who do subscribers contact for Customised Financial Advisory Services? Subscribers who wish to have their ‘hands held’ all the way, from start to finish until profit is taken, may Email: [email protected] to inquire about Peak Prosperity Consulting HK’s (PPC) Customised Financial Advisory Services. 7) How is PPC HK connected to Blue Phoenix Financials? Peak Prosperity Consulting (HK) Ltd is a Financial Advisory company that owns Blue Phoenix Financials and is licensed as well as regulated by the Securities & Financial Commission of Hong Kong (SFC) under licenses 4 & 5. 8) What is the unique factor of PPC HK’s Business Model? The unique factor of PPC HK’s business model is that it ONLY charges clients’ fees (excluding 2% upfront admin fee) when the client makes a profit in the market. No fees are charged when losses are made. This is PPC HK’s integrity-based trading model. In addition, PPC HK does NOT keep client monies. Clients open accounts with the bank in their own name to execute orders directly with the bank thereby eliminating any worries of default risk. 9) What Are The Management Credentials of PPC HK? PPC HK is founded and managed by a small team of investment professionals whose combined experience in the global financial markets adds up to 30 years in total. 10) Is Blue Phoenix Financials Premium Content Cost Effective? Blue Phoenix Financials Premium content is available to everyone at a low rate of only US$41.66 per month, based on a yearly membership of US$500. 11) What is the average return per trade on Blue Phoenix Financials’ Recommendations? Blue Phoenix Financials averages a return of 5-10% per trade covering FX, ETFS, Equities, Bonds, Options and Futures. Our track record is constantly updated and is transparent to all users. 12) How Do I Act Upon The Market Tips Provided In The Premium Section? Subscribers who want to act upon the market tips provided may view the list of online brokers as well as banks below that can execute trades for them.